St. Anne’s Hospital was founded by Lady Anne Clifford in 1653. For more than 350 years spinsters and widows have lived there rent free. Since 1653 the upkeep of the almshouses has been paid for by Holme Farm, which was gifted by Lady Anne for the benefit of the almshouse. Recently the farm hasn't made enough money, so a monthly £65 rent was introduced. Walking into the courtyard of St. Anne’s Hospital through the stone arch facing Boroughgate is like stepping back in time, not only visually but socially too since the residents still keep to the spirit of the rules established over 350 years ago. 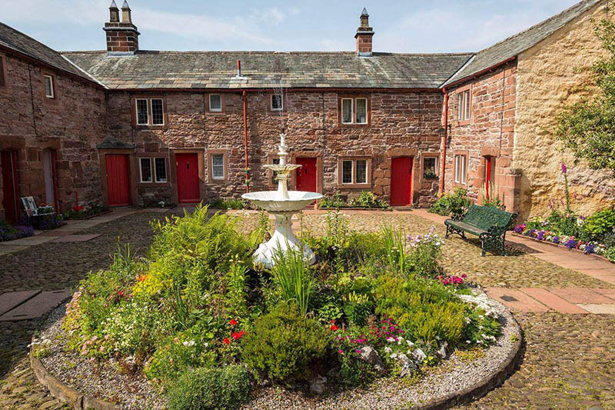 The courtyard consists of 13 self-contained cottages, with one traditionally set aside for a “Mother”, the 17th Century equivalent of a sheltered housing scheme warden. Each property, originally built for “poor widows or almswomen”, has a bedroom and bathroom upstairs and a downstairs living room with kitchen area. No pets are allowed and the residents are not permitted to have male overnight guests. administered by the charity's trustees. Each member of the close-knit community is also encouraged to attend a weekly service at the on-site chapel and must notify the 'Mother' if they are to be away for more than 24 hours. St. Anne’s is usually open to visitors to walk around the courtyard and gardens. You may find yourself in a conversation with one of the residents who might show you the chapel and sell you some of the apples from their garden if you're there in autumn.